"; //	summaryPanel.innerHTML += "From " + route.legs[i].start_address + " to " + route.legs[i].end_address + "
"; //	summaryPanel.innerHTML += "Distance: " + route.legs[i].distance.text + "
"; //	summaryPanel.innerHTML += "Duration: " + route.legs[i].duration.text + "
* The price is set only for departing from Heraklion city. For departures from other locations, please contact us for advising the price. This tour can be combined with a visit to the market of Rethymnon for shopping. The old town of Rethymnon is one of the best-preserved towns of the Renaissance. Lying in the heart of modern Rethymnon, it combines the oriental features of the Turkish period with Renaissance-style Venetian architecture. After the Venetian conquest of Crete (1204), the town of Rethymnon was built according to the rules of Venetian architecture. The original craftsmen were Venetians, but these later were replaced by Cretan murari, Venetian-trained master builders. The layout of Rethymnon is directly linked to the sea, with the main Venetian street, the Ruga Maistra (today's coastal Venizelou Avenue) running parallel to the sea. The opposite is true of Heraklion and Hania, where the town is closed to the sea for reasons of defence and the main street is at right angles to the coast. The private mansions of Rethymnon are not as impressive as those of Venice, mainly for financial reasons. Furthermore, the strong traditions of Cretan architecture could not be overcome, and Renaissance influences are most apparent on building facades. Finally, as opposed to Heraklion and Hania, Greek features are predominant in Rethymnon because most nobles were Greeks, known as “Archondoromeoi” (noble “Romans”, that is, inhabitants of the Eastern Roman Empire). Many buildings with gothic features were lost in the destruction of the town by Ulu Ali in 1571, while Rethymnon was rebuilt almost in its entirety in the third quarter of the 16th century. Many fine examples of Turkish architecture are preserved scattered around the narrow streets of the old town. Their main feature is the heavy use of wood. Building styles changed during the years of the Turkish occupation (1646-1898) and the dressed stone of the Venetians was replaced by a wooden frame filled with rubble and mud (bagdati). The walls were then thickly plastered. The upper storey almost always projects out over the street (sahnisi) and is faced with wood, often with kafasoto latticework. In Rethymnon the Turks made full use of the existing Venetian public and private buildings, which they modified according to their needs. 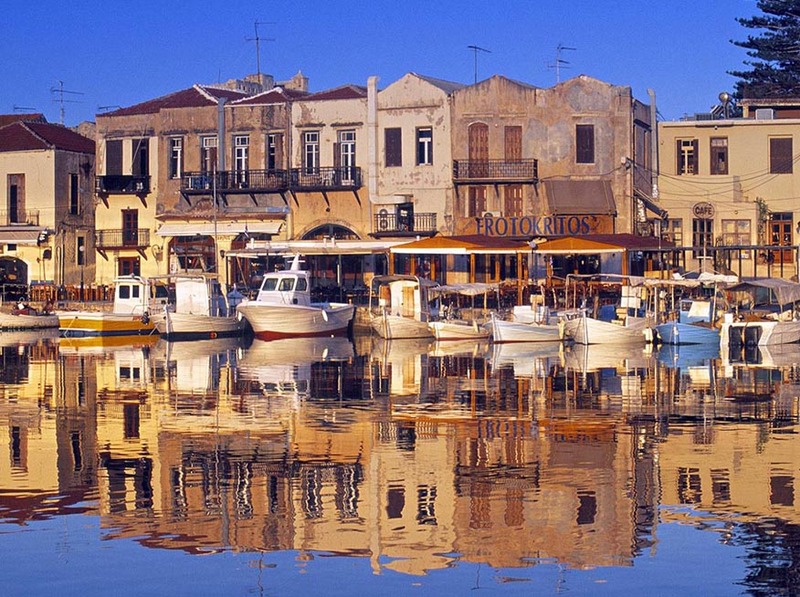 Today the old town of Rethymnon is a living museum of monuments of past centuries. Despite the damage sustained in the Second World War, many Venetian and Turkish monuments still stand, especially as the town has not been struck by major earthquakes. Kournas is the name of a village and nearby lake on the island of Crete, Greece. It is in the Apokoronas region of Chania regional unit close to the border with Rethymno regional unit, 47 km from the town of Chania. Kournas is a fairly large village perched on a hill overlooking the lake. It is in the Georgioupoli municipality, not far from the town of the same name. A working village which has seen less depopulation than some of its neighbours, Kournas is known for its pottery and many popular taverns. The taverna's seats are largely in the road - it is popular for its specialties of 'kokoretsi' (grilled offal) and 'galaktoboureko' (custard and orange tart). 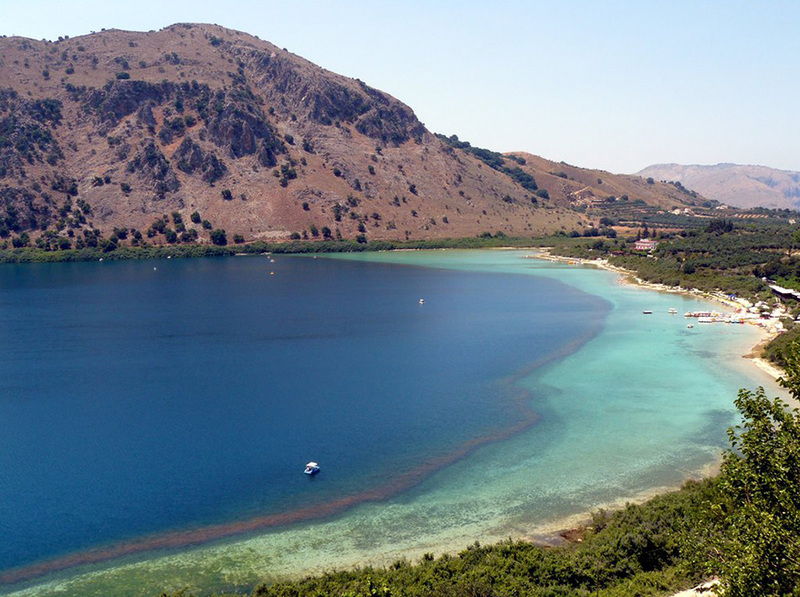 Crete's only freshwater lake, Lake Kournas, is relatively large, with a perimeter of 3.5 km. Although almost all touristic leaflets say that it is possible to walk around the lake, that is not true. At least not at the end of the rain season (winter). There is a nature preserve on the Southwest of the lake. But there is a rustic road from the North of the lake to the Hills on the West of the lake too. The lake used to be called 'Korisia' after ancient 'Korion', a city thought to be in the area with a temple to Athena. The lake reportedly used to be full of eels but now is better known for its terrapins and tourism. Tavernas and pedalo rental shops line part of the shore. Overall, however, the lake retains its beauty, the White Mountains reflected in the mirror-like waters. The width, at the point where the landing stage is built, is about 800 m and the water is of a quality to have caused no ill effects to the writer when he swam across. If you stand, barefoot, in the water on the sandy beach, tiny fish will (painlessly) nibble dead skin from your feet for free! This is a treatment, which several tourist shops currently (2012) offer at a price.